The popularity of under floor heating has risen dramatically in Australia during the last few years, with many of our customers saying that floor heating is the best type of heating they have ever experienced and in most cases, no other heating is required. In fact many people go on to recommend floor heating to friends and family who are building. Today's systems are fully controllable; they can be independently zoned to individual rooms and they are extremely reliable. Classic Floor Heating offer a free quote and design service and with prices starting at under $700 fully installed for a typical bathroom, under floor heating is an affordable luxury for any new home or renovation. We also offer a range of DIY kits with easy to follow instructions. 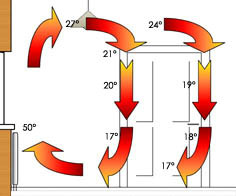 Reverse cycle or ducted heating systems cause large temperature variations causing large amounts of airflow, which, in turn create drafts and dust. 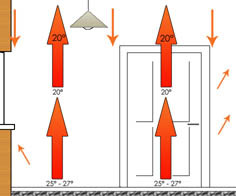 Under floor heating works differently by heating the space not the air, drafts and dust are greatly reduced.